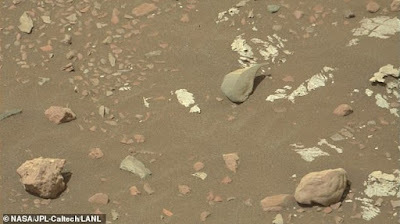 NASA's Curiosity rover is investigating a strange 'golden rock' on Mars. The space agency said the rover is being sent for a close up look at the strange object. The golden rock on Mars: NASA revealed this image of taken of 'Little Colonsay,' a potential meteorite, on the surface of the red planet. It was taken by the rover's ChemCam. Curiosity is now heading back for a closer look. HOW WILL NASA GET A BETTER LOOK? Operators will use the six-wheeled NASA rover's ChemCam to study the rock. 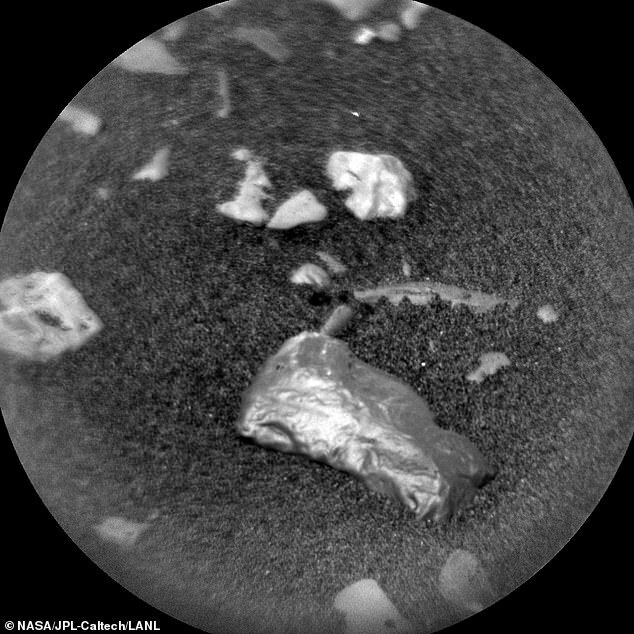 Looking at rocks and soils from a distance, ChemCam fires a laser and analyzes the elemental composition of vaporized materials from areas smaller than 0.04 inch (1 millimeter) on the surface of Martian rocks and soils. An on-board spectrograph provides detail about minerals and microstructures in rocks by measuring the composition of the resulting plasma - an extremely hot gas made of free-floating ions and electrons. The camera can resolve features 5 to 10 times smaller than those visible with cameras on NASA's two Mars Exploration Rovers that began exploring the red planet in January 2004. 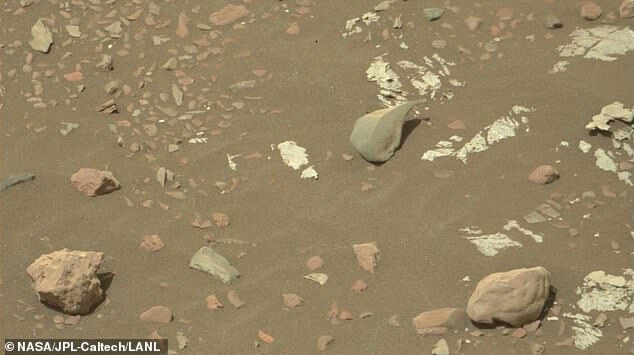 'One of the samples that we try to get a better look at is 'Little Colonsay', NASA said. 'The planning team thinks it might be a meteorite because it is so shiny. 'But looks can deceive, and proof will only come from the chemistry. Curiosity has been working at Vera Rubin Ridge, investigating the Highfield outcrop, a unique patch of grey bedrock. The rover recently underwent an electronic brain transplant. The Mars rover was forced to switch to its spare, Side-A, computer on October 3 after a memory anomaly detected on Sept 15. Doing this allowed engineers to diagnose the issue while the robot continues operations. When Curiosity first landed on Mars, it used its Side-A computer. But, five years ago, it experienced hardware and software issues, and the team switched it over to Side B. The affected part of Side A was then quarantined, allowing the rover to continue storing data and event records on it. The team decided to again make a switch last month after the memory anomaly.